I decided to enter TNF100 after friends Mike and Sue showed me the official TNF DVDs from the last 3 years. My next decision was to sign up with a coach to minimise the risk of injury and get the most from my training. Andy Dubois wrote weekly training programs for me, including lots of hill and stair training, and strengthening exercises. 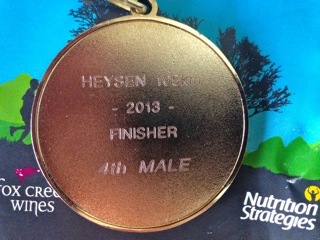 In October 2013 I ran the Heysen 105, my first 100km race. I learned a lot from this and it proved to me I could run 100km. For the next 7 months I ramped up my training. I also decided to use the run to raise funds for mental health charity beyondblue ($2,500 so far). Finally race week came and I knew I just needed to relax, recover, plan, and run a good race on the day. My partner and I arrived in Katoomba on Thursday. I finalised my drop bags, went over the race maps, tried to catch up on sleep, and on Friday went for a 20-minute run. We checked out Scenic World, which is a great venue. On Friday night I went to registration and picked up my race number and t-shirt. This was followed by the Buffet of Disaster and a good panel discussion with Brendan Davies and some of the other top runners. The Welcome to Country was touching – a local Aboriginal woman in her seventies or eighties, who told us she had walked the trails we would run on as a child. After getting up at 4.30am and eating a breakfast of cornflakes, white bread and a few snakes, we took the event bus to Scenic World and ran into a friend Ben, who was also in Wave 2. I had worried about getting cold while we waited, but time went quickly. It was daylight now and forecast sunny with temperatures from 5C in the morning to a high of 18C. The first wave of runners started to loud cheers at 6:30am. 3 minutes later, wave 2 started and we were off along Cliff Drive. The road undulated but was mainly uphill or flat on the 2km out. Runners spread out after the first hill. Ben and I ran at an easy pace. Soon the Wave 1 runners started to pass us in a steady stream on the opposite side of the road. After 2km we turned back the way we had come. I tried to make the most of the downhills. With experience of only one previous 100K race, for me I was trying to find the balance between pushing too hard and not pushing enough. My plan was to make the most of every flat or downhill. Even running a few metres of flat halfway up a long hill would save a few seconds, and adding them all together would make a big difference. On the road section a few runners were going hard, trying to get ahead, but most people seemed happy going at a comfortable pace. Going down Furber steps, the pace was a sprightly jog along the shallower sections and very slow on the metal stairs. There were no huge bottle-necks like I’d heard about. We turned right at the bottom and across the duck boards through the Scenic World mining exhibition. Beyond this the track became rougher approaching the landslide. The pace here was slow with most people running the flats. We were held up by a few runners stopping dead every time they came across a rock or tree trunk, causing everyone behind them a frustrating series of stops and starts. I decided not to stress about this and took the chance to get some food down. I realised that I could save a lot of energy and get into a rhythm by walking a lot of it. This allowed the mini-bottlenecks to clear and avoided the constant stopping and starting. 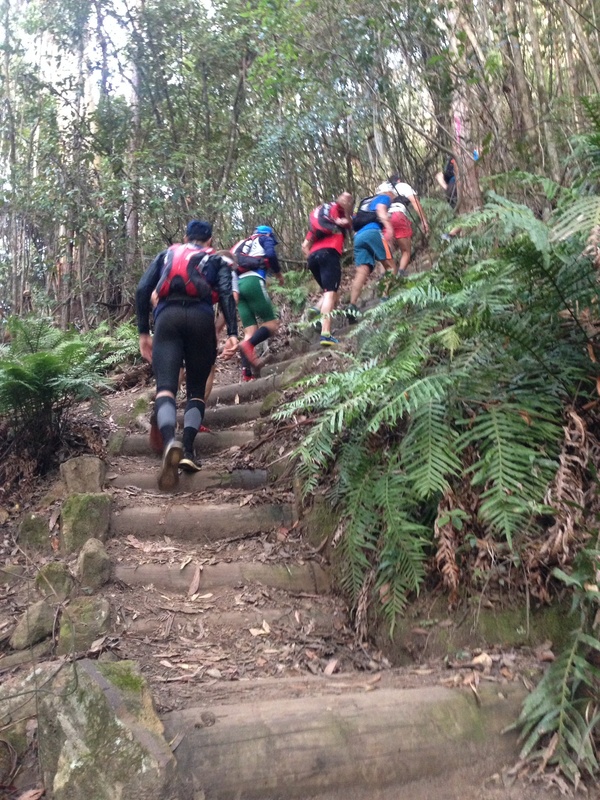 After the landslide, there was a faster section of single-track, then a sharp right up the Golden Stairs, a continuous single-file of runners walking up the 200m of steep uphill and steps. I was grateful for for the press of runners around me, as it made it impossible to push too hard. We climbed at one pace in a slow, slogging rhythm. At the top, we turned left along Narrowneck. Checkpoint 1 was slightly further than I had expected at the top of a long, gentle uphill. A lot of people walked this. At the checkpoint I found myself panicking in case I forgot something that would cause problems on the next leg – I double-checked I had enough gels and Clif bars, drank some water, refilled my bottles, and ran on. The next 10km along Narrowneck Ridge was fast, undulating vehicle track. The views were beautiful, but it wasn’t a hugely interesting section. This became single-track at the end, veering downhill, rougher until we came to Taros Ladders at 21km. This was another potential bottle-neck area. But in a few minutes I was on the ladder and climbing down. This part was fun but smaller than I’d expected from photos. It only took a minute, then we were running fast again down single-track snaking through trees. After 1-2km, we came out onto a fire-track, which led downhill and flat for the next 7km – a fast, easy section. A short, steep and slidy downhill took us into checkpoint 2. On this downhill I felt my knees and quads. So far I was way ahead of schedule, which at this stage of the race was probably reason for caution. Checkpoint 2 was a small affair located among beautiful green fields with horses. There was a marquee, tables, and a neat water dispenser with at row of taps that allowed lots of people to refill bottles at once (these awesome devices were at all checkpoints). I was surprised again by the absence of a gear check. I filled up my bottles, took a Clif bar and a handful of snakes. From Checkpoint 2 we ascended a steep slope onto Ironpot Ridge. Everyone around me walked hard up this. One runner had stopped halfway up, looking knackered and admiring the view. Ironpot Ridge was a part of the course I had been looking forward to, because I had heard that aboriginal people would be up there playing didgeridoo and clap-sticks, and encouraging the runners. I recognised the man who had spoken to us on the Friday night and given us the Welcome to Country. I thanked him for it and he laughed and said, “Yeah my mum killed it, didn’t she!” We continued along the rough, winding single-track, keeping left to allow the returning runners to pass. I tripped twice but avoided completely stacking it. At the furthest point we turned and ran back, then peeled off to the left down a quad-destroying downhill, which I enjoyed. The next section from the bottom of Ironpot to the start of the Six Foot Track road all merges into one in my mind. I remember coming out at a farm after a long downhill and turning left onto a fire-track along the bottom of a valley, following a creek through pines. I remember the scenery as extraordinarily pretty, green and sunny. There were lots of gently undulating sections, then some long, steep ascents and descents through thick forest. There were two creek crossings but both had plenty of rocks and it was easy to avoid wet feet. There was a pretty big ascent up a fire trail, then we were on Megalong Road. The section before CP3 was a long downhill on bitumen, which gave the knees a good pummelling. I heard the noise from Checkpoint 3 before I saw it. We ran through a field, which led down through trees and into the funnel. This was the first Checkpoint accessible by spectators and it was noticeably busier than Checkpoints 1 and 2 with lots of noisy, cheering supporters lining the race route and and a real atmosphere. As I came in, there was a gear check and I was asked to show my hi-viz vest and thermal bottoms. There was no queue and the whole process took all of 30 seconds. I was really impressed by the volunteers, who seemed to want to help the runners through the check as quickly as possible. After Checkpoint 3 were several kilometres of fire track and road, undulating with an overall ascent. We passed the halfway mark and I couldn’t resist snapping a celebratory photo of the “50km” sign pinned to a tree. I had heard the first 50km were easier than the second 50km and in my mind I was thinking of Checkpoint 4 as the halfway point. I had one eye on the next leg, which I knew could make or break my race. My aim was to be running down Kedumba Valley after Checkpoint 5 and not to blow my quads and end up hobbling like an old man, which happened in my first ultra. The track climbed more steeply out of Nellie’s Glen and became single-track with lots of uphill and several sections of incredibly steep stairs. I focused just on keeping moving, no matter how slowly. One runner ahead of me was running short sections, then disappeared ahead. But most people walked. Eventually the trail levelled out and wound gently uphill onto a track and back into Katoomba on Farnell’s Road. A few locals were outside their houses cheering on the runners. some kids had stuck signs to wheelie-bins cheering on their dad. After 10 minutes of bitumen we arrived at Checkpoint 4 (Katoomba Aquatic Centre), up a grassy bank and into the basketball courts. Checkpoint 4 was the first time I saw my girlfriend, which cheered me up. I tried to get down some food and managed half a satsuma, some watermelon and part of a Clif bar. I decided this would be a good place to re-vaseline my feet and put on clean socks. Looking back I’m very glad I did this and I finished without a single blister thanks to just the Injinji and vaseline combo. After 13 minutes (my longest checkpoint stop) I headed out the exit and off down a fun section of single-track I’d explored a few months previously, which cut between houses along obscure footpaths, past a silt trap. 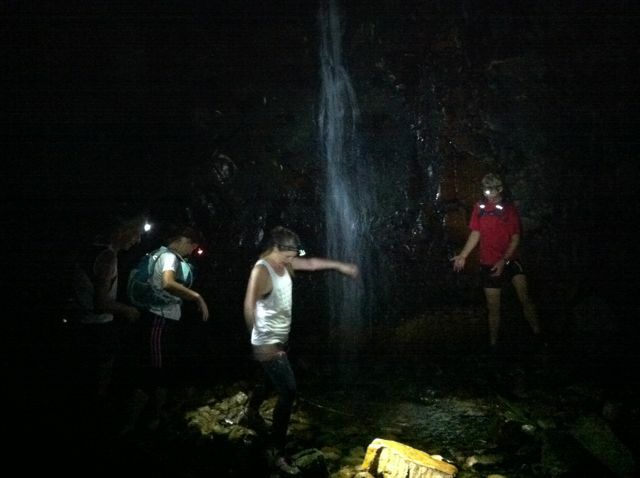 This led down to Katoomba Falls Reserve, which was soaking wet when I ran it two months previously but dry on race day. The route took us round the oval down to Cliff Drive, Echo Point and down the Giant Staircase. On the way down, there was a loud clanging from above and a man in his 60s rocketed past, taking the metal steps so fast it was like he was running from a swarm of bees. Another runner and I were happy to let him go. I had run this leg in training and knew it would be a lot harder than it seemed on paper. The absence of huge hills was misleading, as the unremitting ups and downs and constant steps could take their toll. I had decided I was going to take it easy and not worry about how long it took. Shortly after the bottom of the Giant Staircase, I caught up with the guy who had sprinted down the stairs, which reinforced the importance of sticking to my own pace. This section seemed to go on forever. I didn’t eat enough, because the jarring of the downhill steps was messing with my stomach. We got some pretty strange looks from tourists on this section, which was both amusing (haha, we’re running 100km, we must be crazy!) and frustrating (haven’t you ever seen a runner before?). Finally the trail joined a sandy vehicle track for about 1km to join a bitumen road at the edge of Leura. I saw a few runners ahead of me on the road and ran most of this long, gentle uphill at an easy pace. I managed to swallow half a Clif bar and an electrolyte capsule but by this stage had to force myself and was already behind in calories. I felt heavy and I worried my quads were going to finally burn out on the long bitumen downhill to Checkpoint 5. I knew I needed to take in calories before I could go any faster. Two guys running together overtook me on this section. One I’d seen before, a young guy with a ‘tache and muscle top, who asked if I was ok. This made me worry a little, but I think they were stronger runners and I was at a low ebb. It wasn’t anything too serious. When I said I was ok, he gave me an encouraging pat on the shoulder and they ran off. Approaching Checkpoint 5, Pauline (Howard’s wife and support crew), honked at me from her car and in my undernourished state, I had the sudden crazy thought that it was my girlfriend and where the hell had she got a car from. At checkpoint 5 I changed to a fresh merino t-shirt and the feel of the clean, dry wool on my skin felt amazing and gave me a mental boost. I put my buff on and my head lamp in anticipation. I filled my bottles, made sure I had enough gels and snakes to keep me going for a slow, hard 22km. Ready-made instant noodles were laid out in pots and I tried to get one down, but after a few mouthfuls, eating it was taking too long. I could eat on the move and left after 8 minutes. Soon after leaving Checkpoint 5, I started the long 8km descent to Kedumba Valley. I wondered how many runners would be walking it. One of my main fears before the race was that I would be one of them. Starting the downhill my legs felt good and after a bit, I allowed myself to pick up speed. It was reasonably steep and somehow going faster was easier. I figured the quicker I went, the sooner I would be able to finish. I still wasn’t sure if I was on track for a sub-14-hour finish. I was trying to gain as much time as possible before the long, slow slog up the hill from Jamison Creek. 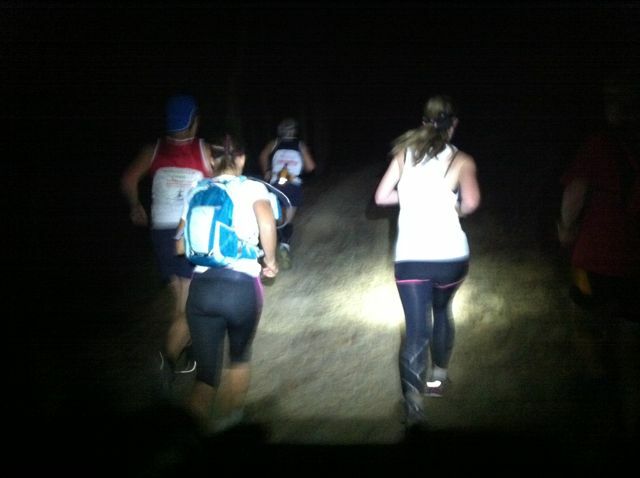 It got dark on the descent and I enjoyed running in the low light for a while, before turning on the headlamp. In that brief period before complete darkness, running alone through the forest, it felt very peaceful. I recognised the concrete blocks crossing Jamieson Creek before the big hill. When full darkness fell, the mood changed and I felt a nervousness that pushed me to keep moving. Through the trees I could see lights on the cliff-tops, but they looked so high above that it was discouraging. I tried not to look at them. A couple of hundred metres ahead, I could see the headlamp of the runner who had passed me on the way down. This was comforting, because the light showed me where I’d be in a few minutes, which was a lot higher. It felt good to be near other runners with all of us slogging it out in much the same way. I wondered how the others were experiencing it. I tried to get some food in on this uphill and I managed to eat a few snakes. I tried to slow as much as possible to eat, but the steep gradient limited how “easy” I could go, so the stomach started its complaining again. This improved when the hill levelled off, before another smaller descent then the second big climb. The 91km aid station was around here. 1km before it I came across Josh (a local and physiotherapist) and his friend standing by a 4×4 with the first-aiders tending to the third guy in their group who had collapsed unconscious. I asked if they needed help, but they said no and Josh told me they had IVs and everything else. We continued together and Josh told me they had been on track for a sub-11-hour time until their friend collapsed and they had to call for emergency help. They had been stopped for quite a while getting help for their friend and making sure he was ok before continuing. We walked on together. Ahead next to the track was a 4×4 and a small bonfire. We passed through the 91km emergency aid station together, where a volunteer filled up our bottles from a kettle and told us we only had 3 more km of uphill fire track, then we would be on the flat section through Leura Forest. I was sorry to leave the bonfire behind. 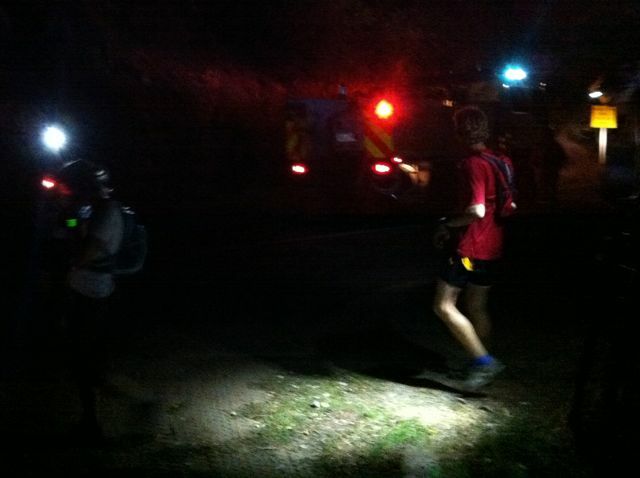 Josh and his friend were pulling ahead and climbing that long hill in the cold and dark, I just wanted it to be over. It helped having run this section of the course once before, and I mentally checked off landmarks as I passed them: the end of the steep climb, the transition onto single-track, the left turn at the sewage pipe. After the sewage pipe at ~94km, I knew the track was relatively flat until Furber Steps, so I figured about 4km at an easy pace and I could eat it up in no time. Unfortunately, just after getting onto this section I completely bonked/crashed. Within several minutes, all strength left me and I slowed to a walk, then to a slower walk. My balance was sketchy and I could barely put one foot in front of the other, let alone run, even on the flat, which I knew was ridiculous. I knew I needed to eat something quickly, so I downed a whole Clif bar and took an electrolyte capsule for good measure. I was glad I’d decided to carry some water on this final section. I was annoyed with myself for not forcing myself to eat regularly in the later part of the race. For the first six hours or more I ate regularly at 20-minute intervals, but I realise that later on, when eating became harder, I stopped eating regularly and time just got away from me without taking in enough calories. At this point I was alone in the dark on the flat path through Leura Forest. There was no one around although I had seen head lamps behind me. I knew if I waited and moved slowly (not that I had a choice at this point), it was just a matter of time until the sugar went in and I would feel stronger. In the meantime I kept walking slowly along. By this stage I knew I was still on track for a sub-14-hour finish, which was a huge psychological boost, as it meant I just needed to keep moving. As I started to feel stronger, I walked faster but there was no way I could run. Several people ran past me. Eventually I felt well enough to run a bit and I remember a nice downhill past the sign for Dardanelles Pass. I walked all the uphill until I reached the bottom of Furber Steps. Josh had told me it was only 20-minutes from there to the finish and I knew it was almost over. Still, I was dreading the switch-backs at the top that seemed to go on forever. I used my arms to help pull myself up the metal steps and managed to jog the flatter sections. This didn’t seem to take too long, until suddenly I saw Scenic World and found myself on a wooden walkway. I was confused for a minute, because I thought we had to run to the top of the steps, then along the road to finish. But as I came the few metres along the walkway, I saw people standing there start to clap. Rounding the corner I found myself with only the final few metres to go, and crowds of cheering spectators. It was a great atmosphere for runners to finish to a loud crowd and pumping music. Having expected to be running at least another 2km, I broke into a celebratory sprint finish across the line with a finish time of 13hrs 38mins 47sec. My first thought was relief and joy that I’d managed to beat the 14-hour mark and I knew I’d earned the silver medal. At the start of the race I really didn’t know if I could do it and it depended on so much going well on the day, plus the usually element of luck. As I finished my girlfriend came up and gave me a hug. My lower body was tired and sore, but I actually felt fairly ok, although was dying for a drink of coke. We picked up my finish-line dropbag and I changed into a completely fresh set of clothes with compression tights, which would stay on for 3 days afterwards. The fresh set of clothes felt amazing, as did the litre of coke, pepperoni pizza, and hot chips. We sat and chatted with friends Howard and Pauline, Emma who had run the 50k, and Ben who finished not long after I did. Everyone was glad to be finished. I saw Ben with a medal and perked up, not having realised that we could pick them up immediately from the finish-line. I went over and told them my race number. They handed me a silver medal and a velvet bag for it. Yes, it’s only a belt buckle, a bit silly, but it’s what it represents that’s important. My first race I’d run where belt buckles were given out, plus a sub-14 100km over tough terrain. I pretty much kept staring at the buckle for the next 24 hours. Runners were still coming in quite close together across the finish and there was lots of cheering. I was really tired and was happy to sit and chat with the others. After a bit we went outside to watch some of the finishers coming in. And because Pauline had secretly arranged for the emcee to get the crowd to sing happy birthday for Emma. Emma had seen it happen for another runner earlier and wished she’d told them. The whole crowd sang happy birthday for her and she won a fancy watch, which was fairly impressive. I had originally planned to stay behind and watch people come in, but I think we all felt so tired that we soon went back to the hotel to sleep. Pre-race sleep – poor sleep in race week. Avoid early flights next time. 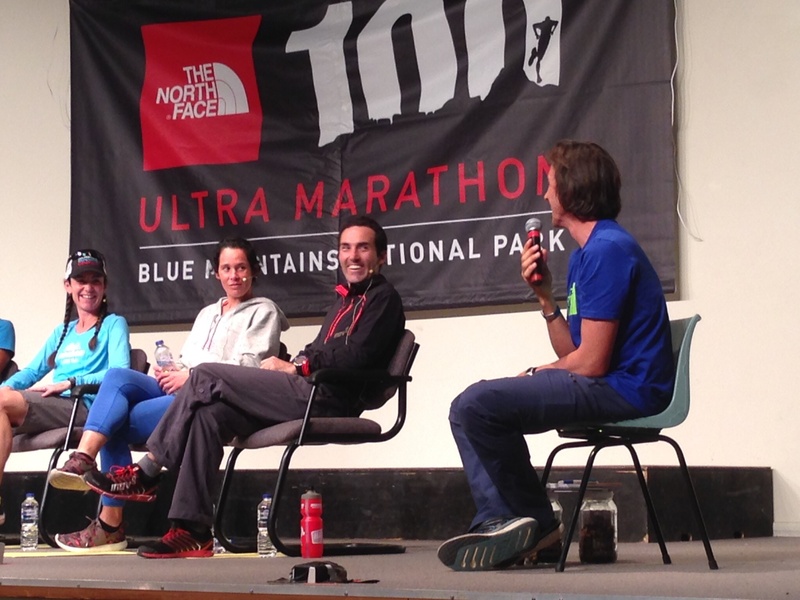 Nutrition in 2nd half of race – need to have backup plan for times when difficult to eat. Jonathan, Deborah, Glen, Mum, Lenny, Doreen, Janet, Karen, Bev, Anthony, Fleur, Brenton, Matt, Sally, Teresa, Emily, Ann, Ana, Pedro, Anon, Bianca, John, Eric, Maureen, Chispa & David, Nicole, Toby, Anna, Cameron, Denise, Dej, John & Sandra, Tina, Jill, Howard, Julie, Robin and Anne, Kitty, Jon and Sadie, Mum, Nicky & Dianne, Paula, Greg, Tony & Ros, Bee. "There's only one thing worse than running Yurrebilla... not running it!" This update to Faster Uphill has been delayed by one word: Yurrebilla (That was true a week ago – since then a second word, “procrastination”, entered the picture). 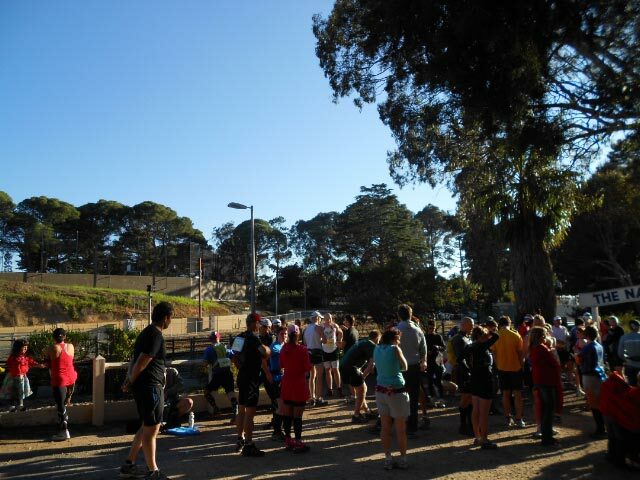 Yurrebilla is a 56km annual trail race through the Adelaide Hills, which follows the Yurrebilla Trail walking route. I finished in just over 7.5 hours, which I was happy with. The winning time was a little over five hours. The race started in three waves with slower runners starting first. I was in the middle wave with two friends at 7.30am. Proving the rainy forecast wrong, it was a crisp, clear morning. I had a video camera on a chest strap in an attempt to record my experience of the race – I had tested it once briefly, but this was still an experiment. I knew I would have to change batteries half way, and I also knew that the video would never see the light of day if I did not complete the race. After a short pre-race briefing we shuffled past a small group of photographers then launched off along the narrow, winding gravel and dirt tracks of Belair Park. Through the tunnel, then we were passing the first aid station. We were almost at the back of our wave, having deliberately set off slowly, knowing that this race was about the “long game” with plenty of hills to come. The first hour and a half was pretty straightforward with some hills but nothing too awful. Nathan took off ahead just after Brown Hill Creek leaving Jeremy and me. 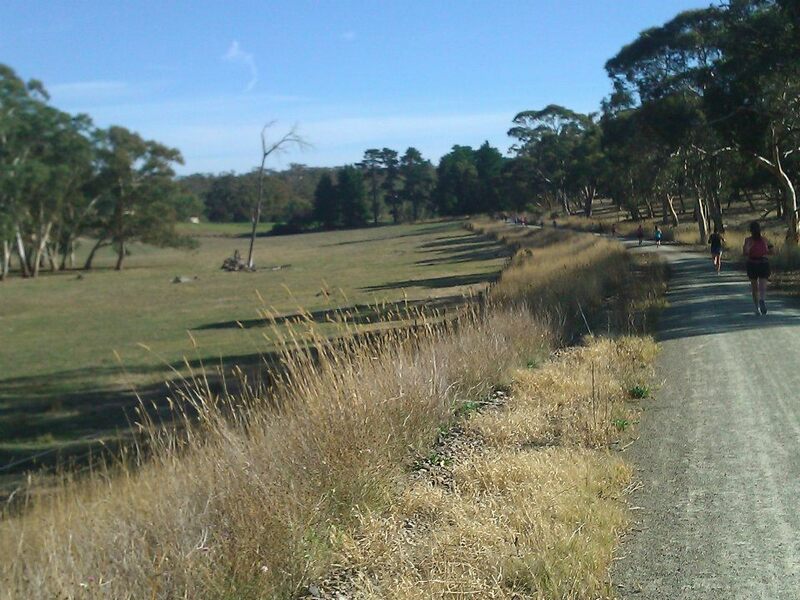 The sections down to Brown Hill Creek and through the farmland before The Old Mt Barker Road were beautiful. At The entrance to Cleland there was a welcome aid station with RICE PUDDING (!) 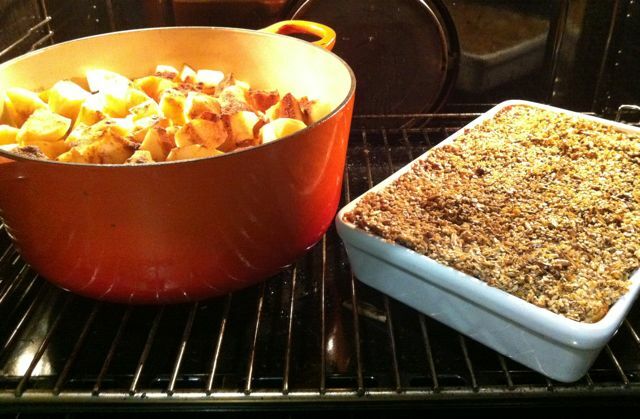 in egg-cup-size plastic containers and with fruit compote on top. I don’t know whose idea that was but if I ever meet them I want to shake that person by the hand. I also had energy drink and fresh fruit. The well-stocked aid station became a pattern throughout the race, but this sticks in my mind because it was the first. Then it was downhill to join Waterfall Gully briefly, dodging the weekend traffic, before diverging to the left up the steep ascent to Cleland Wildlife Park. Now that was a hill! We cleared the 20km mark at Cleland with Jeremy’s wife and children cheering us on with a “family aid station” featuring moral support and fresh, home-made brownies. They became my adopted family for the race, which helped keep my spirits up later, when they appeared at various stages of the race with the brownie box and plenty of smiles and cheers. 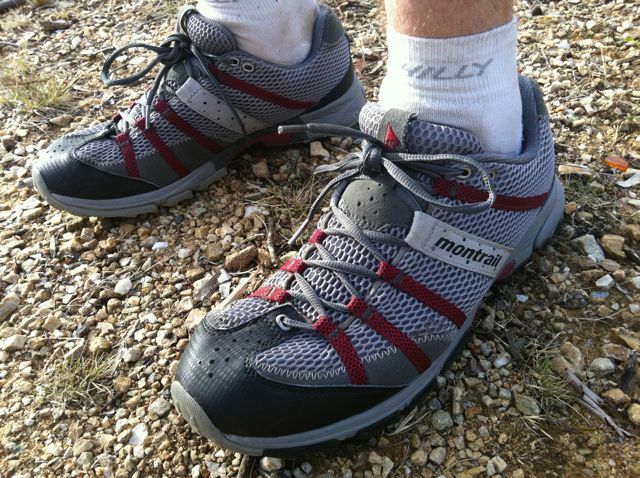 We were managing water well – I was carrying one water bottle, which I refilled at aid stations. I had originally thought of using a running backpack with a bladder, but I was glad I hadn’t taken anything extra, as the aid stations provided drinks, gels, even vaseline. I met a few people I knew going down into Horsnell Gully, and passed an older man dressed from head to toe in striking orange – including, rather impressively, sparkly orange trail-gaiters. I found out the reason for this at the finish line, (I couldn’t resist asking!) when he told me his son owned a coffee shop in Melbourne which was painted completely orange throughout. He had sponsored his father by providing all-orange clothing for the race, but had forgotten the most important part of sponsorship, which was the name of the business. The ascent from the bottom of Horsnell Gully seemed to go on forever. Eventually it peeled off onto the road and down to the scenic village of Norton Summit, which I’ve only ever been to when running. We ran along another stretch of road, then into Morialta, which to me is the most striking part of the route – eventually running along a narrow path which coutours around with a spectacular view of golden cliffs and a ribbon of a waterfall far below. The route was well-marked and the two easily-missed turn-offs were obvious with red arrows. At the second were the volunteers of the Best Dressed Drinks Station, whose craziness was almost as great as their kindness (how’s that for a back-handed compliment!). There was a flapper, a man in an African fur suit and hat, and people blowing party kazoo type things. A real party vibe, which belied the multiple trips up and down the hill by the volunteers, carrying supplies. A quick drink and we were off up the hill. It was on the downhill to Montacute Road that running started to become really unpleasant. It was as if my downhill muscles were so exhausted that my knees were just cartilage on cartilage. For the rest of the race I longed for uphills. We did walk some of the downhills but with a tactical stretch of the hamstrings every now and then, things improved. The ascent of Black Hill wasn’t as bad as I’d expected – just a matter of alternating walking and jogging, and walking the steep gradient where it turns right at ninety degrees to follow the spur directly uphill. We passed a few people going across the top of the hill, trying to keep the running going for as much of it as we could. We spotted an echidna hiding in a ditch just before the start of the descent to Ambers Gully. It was tempting to join it, but I resisted and it was a long jog down to the finish line. Laugh In The Face of Pain! Approaching the finish on a single-track footpath, it was hard to think of a gentlemanly way to decide who should go first. By coincidence I was in front of Jeremy when the track widened out and I just gradually increased the pace. Just before the line I heard the crowd cheer and it ended with Jeremy and I doing a sprint finish. Some of those who had already finished had decided to stay behind to cheer the finishers, which was great to see and there was a fair bit of clapping, cheering, and (as at the aid stations) FOOD and DRINK! There was a real buzz at the finish with people so happy at their achievement, standing around talking. I got my finisher’s medal, which is the first time such a medal has actually meant something to me, as I felt finishing really was an achievement. Yurrebilla has been the high point of seven months of exploring trails in Adelaide, my new home. 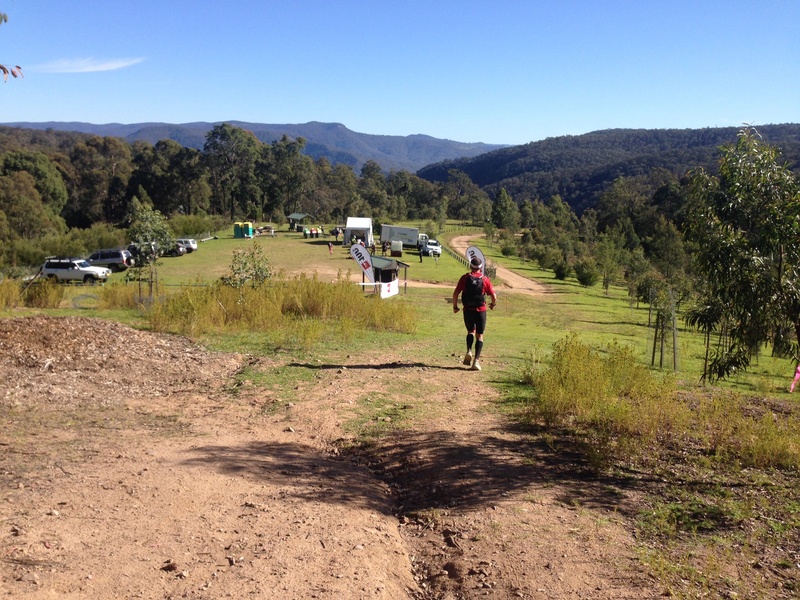 This week I discovered Anthony Bishop’s fantastic blog Sweet Vertical, including his entry about running this year’s Yurrebilla. He talks with obvious love of his exploration (day and night) of various obscure trails around Black Hill. Hopefully I will explore some of these in the next year. See also Terry Cleary’s article on Yurrebilla turning five. 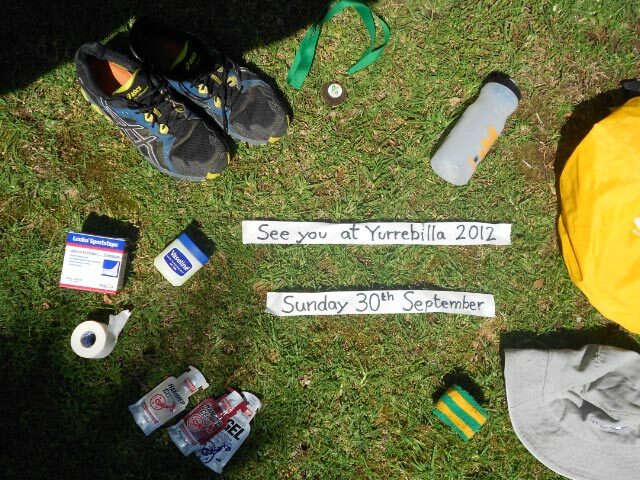 I hope to run Yurrebilla again next year and beat this year’s time. Next on my list is the Six Foot Track if I manage to enter (last year it apparently filled up within ten minutes). My Hi-tech Leukotape Titling - the date was what was posted on the website but has since changed to 23rd Sept.
How far is far enough? 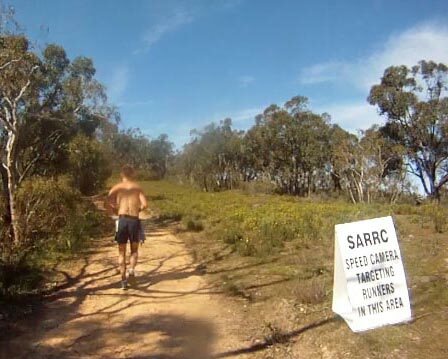 My running over the last few months has been leading up to my longest race to date, the 56km Yurrebilla Trail Run, which is now only two weeks away on 25th September. I started running 3-6-mile cross country races as a teenager, progressing to half marathons as a student, and in the last few years have raced up to 17 miles in hill and trail races. I used to have a fairly limited view of the limits of endurance, and anything over half marathon distance in my mind was entering the realms of the superhuman. Over the last few years, however, I have met various people who make running up and down mountains look effortless. The psychological component is important, but what I have realised is that endurance is open-ended. Beyond a certain distance it seems there is a comfortable pace which can be maintained almost indefinitely. Someone once said to me that we are always capable of giving more, of going beyond our perceived limits. I have had some experience of this and always try to remember that, in the absence of injury, what stops us is usually our mental barriers, rather than genuine physical limits. A few years ago a farmer friend of mine told me about an ex-soldier in his sixties, who stayed in their guest house in northeastern Scotland. The farm was at the base of a reasonably sized hill and early every morning the man would run up and down the hill. I found this story inspiring and my aim is to be that fit at the same age, and to be able to break into a run at any time and have the basic fitness to run up a mountain. So… these thoughts have been my pep talk while I’ve been imagining what it will feel like beyond the 30km mark in a few weeks time. Great thoughts from someone who has never even run a marathon, and is now taking on an ultradistance race. But the truth is I really have no idea how it will be, except that at some point I will probably feel so bad that every fibre of my being will want to stop running, and I hope I have the self-will to keep putting one foot in front of the other. There are aid stations on the way with water and food, and I have a plan for topping up hydration and electrolytes on the way. I’m prepared. But with 56k and 1865m of vertical ascent, anything can happen. I was inspired by Dean Karnazes’ story of taking up running again after a night out drinking until 3am, after which he put on his shoes and went on a huge run purely on impulse. The image he presents of being just a regular guy who likes running is disingenuous, and obviously a pose he enjoys, but the book is full of inspiring stories in which his obvious love of running shows through – like running a steep hill and being passed repeatedly by two soldiers with back packs, then reaching the top to find them doing push-ups on the ground. Then meeting the two again at the Western States 100 mile race, which he completed, even though one of them did not.